Saadi Alkouatli is currently a Creative Director at Leo Burnett Dubai. 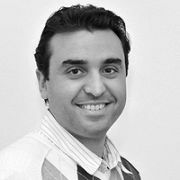 In his previous role as Digital Director/Associate Creative at KELLETT Communications Inc., Saadi helped bridge the digital and traditional needs of Northwestel, the sole telecommunication provider for Canada's North. He also collaborated with Kellett's art and digital development teams across the Yukon and NWT on diverse projects. Saadi previously worked as a National Creative Director at TBWA/RAAD in Saudi Arabia and a Senior Art Director at McCann-Erickson in New York. He was also an Art Director at Saatchi & Saatchi in Beirut. During his 15 years of professional experience, he worked with clients such as Nissan, Infiniti, Viagra, Henkel and Motorola, Major League Baseball, Johnson & Johnson, the US State Department and Lowe. He won numerous awards for his work, most notably Gold and Silver Gold and Silver at Dubai Lynx 2009.